Unschooling – Is that part of our 21st century toolkit? “Defined most simply, unschooling is not schooling. Unschoolers do not send their children to school and they do not do at home the kinds of things that are done at school. More specifically, they do not establish a curriculum for their children, they do not require their children to do particular assignments for the purpose of education, and they do not test their children to measure progress. Instead, they allow their children freedom to pursue their own interests and to learn, in their own ways, what they need to know to follow those interests. They also, in various ways, provide an environmental context and environmental support for the child’s learning. Life and learning do not occur in a vacuum; they occur in the context of a cultural environment, and unschooling parents help define and bring the child into contact with that environment. It is believed that 10% of homeschoolers are unschoolers in USA. Which translates to 150,000 students and more. I supposed unschool takes the concept of homeschool one step further. For homeschooling, there is a prescribed syllabus and you teach your child according to what the syllabus prescribes. There is a network for homeschoolers and you can purchase the syllabus online. Unschooling is based on the premise that every child is curious and talented in some ways. The parents help to shape their learning. I like the sentence that “they believe that education is a normal part of all of life, not something separate from life that occurs at special times in special places“. So is there a place for unschooling a child in Singapore? We have founders like the founders of Kampung Temasek who are trying a new way of learning. We have homeschool organisations who provide families a systematic way to ensure their child gets a validated curriculum for their education.We have parents who chose homeschool to inculcate certain values in their children. But there again, do parents need to homeschool or unschool their children to teach them values? Is there value in a formal school education? Recently I have the privilege to host an ex-colleague and her two children in Singapore. Her boy(P3) and girl (P5) studies in Hong Kong(HK) Singapore International School, a school based in HK and uses the Singapore syllabus. They were here on for Easter vacation. Here’s what I observe when I was “babysitting” her two children while she was having her much deserved break and facial. 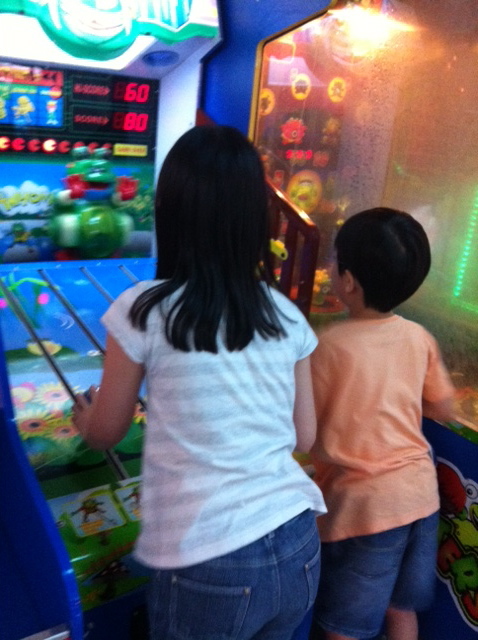 Jeremy(the boy) and Joy(the girl) were given ten dollars each to spend. I was a bit worried. I am not sure if we should go to the new JCube to do ice skating or walk around IMM where my friend was having her facial. IMM seems like an adult place and what is there to see and do at IMM? kiddy rides? Popular? But we had been at Popular just yesterday to buy some assessment books. So we were at IMM. Walking aimlessly. Surprise no 3. My friend was not done with her facial yet. We walked over to take a drink at Ah Mei, a local food joint. I told them, “Hey time for a little iPad game..no need $$. Just use my iPad while I take my fix of tea halial and chwee kueh.” Imagine my pleasant surprise where Joy took out her remaining $2 and waved at the auntie to use her $2 to pay. Well, $2 was not enough to pay. I started to take out my wallet to pay. “No, no, Auntie Pin lay, you keep your money!” Both of them said almost simultaneously. Jeremy started to fish for his ununsed $10 to rush to pay for me. I wished you were there to see the amused look of the auntie serving us at the counter. So my $5.10 refreshment of tea plus chwee kueh were totally paid for by them. Not a small amount considering that it is 51% of Jeremy’s pocket money! So to what extent should the the parent’s involvement in their children’s education be? Do you think “unschooling” is a good option for your child? If not, why not? Or should it be part of the suite that is available for Singapore parents to choose from? What type of support do you think you will need? What type of skills? How do you teach values to your children so that even when you are absent they will bring happiness to others and joy to their “baby sitters”. Next Post Oh no, he’s done it again…called to the Principal’s office! I would say unschooling occurs in all households until a child enters the formal education system. Manners, discipline, attitude, curiosity for the world and respect for others are all acquired knowingly or unknowingly from the significant adult way before a child enters the formal classroom setting. Participation in formal schooling if managed correctly enhances the unschooling experience. Unfortunately many parents and educators see the two domains as separate entities and even serving contradictory purposes. As a result the child is torn between the unschooling experience and the formal schooling experience. The power of the unschooling experience in shaping a child’s value system lies in its subtlety. Unschooling may not have a prescribed curriculum but its impact can be huge. The same children who have learnt to buy snacks for others may also through the “simple game of hitting the belly of an ugly looking frog, ” imbibe the value that it is acceptable to hit or hurt another creature (albeit a digitised one) because it is ugly. Taken in this light, unschooling is much more demanding that formal schooling. Here learning happens continuously and even subconsciously, yet the consequence is no less serious than that which is achieved through formal education. Perhaps a parent knows what an awesome task it is to school one’s own child and is only too glad that there’s the formal education system to take over the challenge.